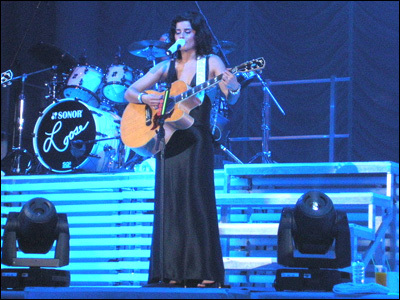 Nelly Furtado has two distinct public personas. One is the hippy chick who combines her Portuguese musical heritage with a love of pop and hip-hop to produce gems like I'm Like A Bird (the bird, in case you're interested, is a cultural magpie). The other is the globe-straddling promiscuous girl - a hip-hop disco queen who, coincidentally, eats men. Both Nellies were on display last night at the Hammersmith Apollo, but it was fairly easy to work out which one was the real deal. The show began with a couple of tracks from her Timbaland-produced Loose album. The bass shook the floor as Nelly took to the stage but she seemed oddly disconnected. Stood atop the third tier of her set, the singer was impassive as four dancers cavorted like escapees from the Mickey Mouse Club at the bottom of her staircase. The problem, in part, is that Nelly isn't what you'd call a groovy dancer. In fact, she moves a bit like your Auntie Brenda at a barmitzvah. On crutches. ...The true Furtado, as we are soon to find out, is a musician first and foremost. After the opening salvo of uptempo numbers, she saunters off-stage to change into a stunning backless black ball gown and launches into a six-song set of smoochers. Given the chance to sing, rather than shimmy, she suddenly takes control of the stage. An acoustic cover of Gnarls Barkley's Crazy gets the crowd singing along and the pint-sized popstrel dons her own guitar for a stripped-back version of Hey Man. She also premieres a new song, Stars, which she says will be filmed and made available on youtube for fans to download. How very modern. Having let her musical juices flow (quite literally - a man appears to mop the stage with a towel), the Canadian-born singer is more confident on a second set of dance tracks. A remixed version of I'm, Like, A Bird and a foot-stomping rendition of Forca see her running about the stage, climbing up the rafters and, eventually, indulging in a bit of choreography. By this stage, the crowd is on their feet, too. She's joined by percussionist / rapper Socrates - who earlier delivered a blistering support slot - for the encore which ends with the musical behemoth that is Maneater. It's the one point where the old Nelly and the new Nelly seem perfectly in sync, as she draws the thumping dance track into an extended sing-a-long before indulging in an impromptu spot of drumming. If she can reconcile those split personalities to similar effect on her next album, Furtado will finally achieve her long-held promise.